Need a place to relax and do some internet surfing? This is the place! "Yep, it's free. Just sit down, open up your laptop and you're ready to go. Send an email as you munch a warm bagel. Read the news as you sip a latte. It's a nice alternative to the office, isn't it? Please relax, do what you need to do, and stay as long as you like. The Wi-Fi's free all day long." The aromas in Panera Bread bakery-cafe brings freshly baked artisan bread to Anderson with flair. While you cruise the internet or talk with friends, enjoy choices of breads, sandwiches, soups, salads, bakery items, and organic foods. 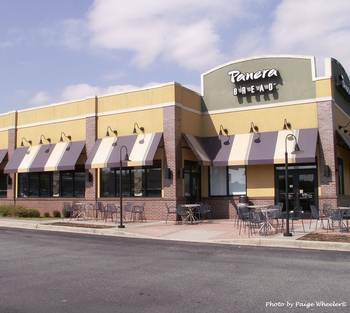 Panera is a "fast casual" restaurant and can also cater your events. Panera operates the largest free wireless network in the US. Come in and enjoy getting your work done! Hours: M-S 6:30 a.m.-9 p.m.; Sunday 6:30 a.m.-8 p.m.